Ptosis is the medical term for drooping of the upper eyelid, a condition that may affect one or both eyes. It most commonly occurs as an acquired condition but can be congenital. When the edge of the upper eyelid falls below its normal position, it may block the upper field of vision. Common symptoms include: decreased ability to keep your eyes open, eye strain, eyebrow fatigue and headache. Many patients complain of having a “tired” appearance. The eyelids are integral in facilitating the normal functioning of the eye. As such, the eyes are thoroughly examined. A thorough medical and ophthalmologic history is taken with note taken of any previous eye diseases and/or surgery. Because our physicians are trained in Ophthalmic Plastic surgery and Ophthalmology as well, they are uniquely qualified to evaluate and perform this type of surgery. A biomicroscopic examination is performed to assess the ocular surface. The propensity for dry eye formation is evaluated and eyelid function and form are examined. Specifically, the laxity of the lids, the amount of eyelid closure, the position of the lid crease, the eyelid excursion and the position of the lid margin in relation to the eyeball are noted. Ptosis can be the initial sign of a systemic disease or occur in conjunction with various syndromes. Frequently, patients need to be tested for diseases such as Myasthenia Gravis. Upper eyelid surgery is commonly performed under local anesthesia in the office or as an outpatient. Frequently, patients are asked to arrive 1-2 hours prior to surgery. This allows the nursing staff to draw appropriate lab work, start an IV and answer any further questions you may have. An anesthesiologist will discuss anesthesia prior to surgery and answer any questions you may have. In general, surgery takes approximately one hour. The incision and resultant scar is hidden in the eyelid crease. After upper eyelid surgery, patients may have a dressing placed on their upper eyelids which does not obstruct their vision. For the first several days after surgery, patients must keep their wounds clean and dry. It is not unusual to temporarily be unable to close your eyes after eyelid surgery. For this reason we may ask patients to put antibiotic lubricating ointment in their eyes nightly for the first 1-2 weeks. The same antibiotic ointment is placed on the wounds twice daily to prevent infection. Oral antibiotics and pain medication are frequently prescribed. Sutures will either be removed at one week or may dissolve. Ptosis surgery is very safe and is one of the most common eyelid procedures we perform. Bruising and swelling are common and usually subsides within 1-2 weeks. Inability to close the eye is also common during the first 1-2 weeks. Significant scarring and pain are unusual as is infection. As with any surgery in and around the eye, there is a risk of loss of vision. Most experts believe that this risk is approximately 1/40,000. Any significant postoperative bleeding, pain, redness or visual disturbances must be reported to your physician. 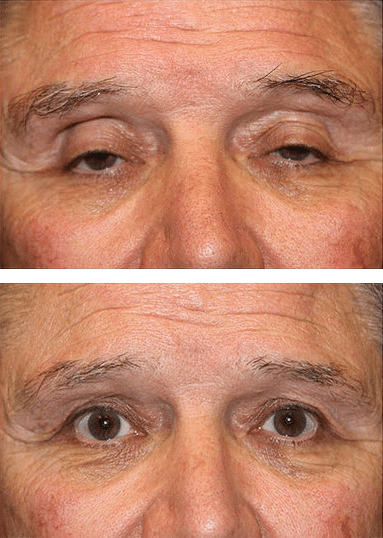 Most Ptosis surgery is performed in the office or as an outpatient under local anesthesia. Complications are very rare and include: bleeding, infection, bruising, swelling, inability to close the eye, scarring and loss of vision. Because the muscle that raises the eyelid is elastic and not static in nature, there is an approximate 5-10% risk of over or under correction of a “droopy” eyelid. Should this occur, the problem can be corrected once all swelling has subsided.